In the era of personalised medicines and oral chemotherapy taken at home, Bowel Cancer Australia is getting Aussies ready for the future of patient care with a new bowel cancer app. Bowel Cancer Australia chief executive Mr Julien Wiggins said the days of the passive patient are long gone. "The ways people seek information, their interaction with health professionals and how they manage their conditions are now significantly different to what they were a decade ago," he added. "Technology is a key driver of that change. We're using it to make things a little bit easier for patients and others wanting information on bowel cancer, our second biggest cancer killer." The comprehensive bowel cancer app, believed to be the first of its kind globally, provides easy access to accurate information about bowel cancer, its prevention, diagnosis and management. It comes in the same month a World Health Organisation (WHO) report that found cancer is now the number one killer of Australians with bowel cancer being one of the most common causes of cancer deaths. "In Australia, we have one of the highest rates of bowel cancer in the world. Despite the multitude of health apps available and the prevalence of bowel cancer, no one's really put the two together, until now," explained Mr Wiggins. "Our bowel cancer app is responding to the changing needs of bowel cancer patients and their families or carers."  "For example, as more oral chemotherapies become available enabling people to receive treatment at home, we expect to see a shift away from written patient treatment diaries to online diaries that can then be emailed to the patient's specialist." "We've also designed the app to be easily personalised. It has the capability to store screening reminders, treatment and mood diary entries and even record notes from medical appointments." "By making this important information available on devices such as mobile phones and tablets, more people have the opportunity to share knowledge that can potentially save lives." "More than 129,000 Australians are expected to be diagnosed with bowel cancer between now and 2020. With 65% of Australian households having a smartphone user and 33% having a tablet, the app is a very practical tool," said Mr Wiggins. The bowel cancer app is free and available for Apple and Android smart phones and can be downloaded via the App Store or Google Play respectively. With more people utilising their mobile devices than ever before, Bowel Cancer Australia has improved the features and functionalities of the Bowel Cancer App version 2.0. The updated Bowel Cancer App 2.0 retains the comprehensive bowel cancer content frequently accessed in the first version of the app including the ‘Need to Know’, ‘How to Test’ ‘Living With’ and ‘Need to Ask’ sections, but also offers users additional benefits previously unavailable. A new ‘Motivate Me’ feature enables people to monitor their diet and lifestyle on a daily basis as one way to help reduce their bowel cancer risk. Users can also connect one-to-one through the App as part of Bowel Cancer Australia’s Peer-to-Peer support and buddy network, Australia’s only national bowel cancer support group for patients and loved ones. Other valuable features include screening tips and tools, a list of questions to ask throughout the patient journey, a customisable treatment and mood diary, recipes and a meal planner. 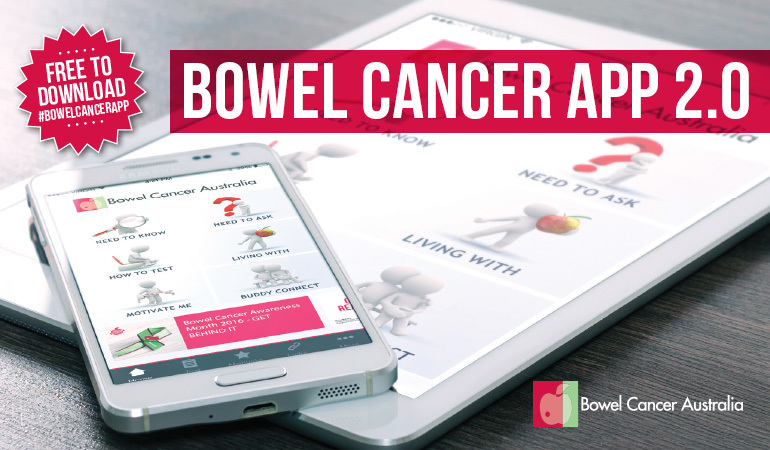 Consistently featuring in the top 100 medical apps in both the App Store and Android Store, the Bowel Cancer Australia App provides users with answers to questions about bowel cancer which many people feel uncomfortable asking and continues to make it easier for people to access relevant bowel cancer information. Go to the bowel cancer app on the App Store now (for people with an Apple device). Go to the bowel cancer app on Google Play now (for people with an Android device).